In accordance with the regulations on application for approval of the Conflict of Interest Policy published in June 2010, the Japanese Society of Anesthesiologists (JSA) has been asking speakers at the annual meetings of the JSA, beginning in 2010, to disclose any Conflicts of Interest. When you submit your abstract, please declare whether there are conflicts of interest amongst any businesses affiliated with the research and representative speakers including coauthors and co-researchers within the past three years. Please disclose any COI when you make your presentation at the meeting. Oral presenters must include this in the second page of their slides. Poster presenters must indicate this status either at the beginning or the end of the poster. Please note that if you fail to attend the meeting in Yokohama without prior notice, you will lose the right to submit abstracts at any meetings of the Japanese Society of Anesthesiologists for one year from the date of absence. There are three types of poster sessions: nominees for the best presentation award, poster presentations, and poster discussions. Authors are required to be present during their designated poster session. You are requested to hang your poster at the Pacifico Yokohama Conference Center 5F, and present your study with slides at the designated room. You have 10 minutes for presentation and 5 minutes for discussion. The best presentation will be selected and awarded at the congress banquet. You have 7 minutes for presentation and 5 minutes for discussions to take place in front of your mounted poster. Each presenter has to hang his/her poster in the designated room (Pacifico Yokohama Conference Center 3F or 4F). A specific poster board identified by an abstract number will be assigned to the authors. If your presentation time is in the morning, please hang your poster from 8:30am～9:30am. Afternoon presenters should do this by 1:00pm. Presenters are required to be in attendance during the designated time. All the posters must be taken down between 4:30pm and 5:30pm on the presentation date. Any posters left remaining after 5:30pm will be removed. If your presentation style is designated, poster presentations you have 5 minutes for presentation and 3 minutes for discussion to take place in front of your mounted poster. The poster will be displayed at the Pacifico Yokohama Exhibition Hall 1F. The size of the board is 160 cm (high)×90 cm (wide). Please layout and print your poster clearly so that everyone can see your presentation even if they are standing slightly away from the panel. 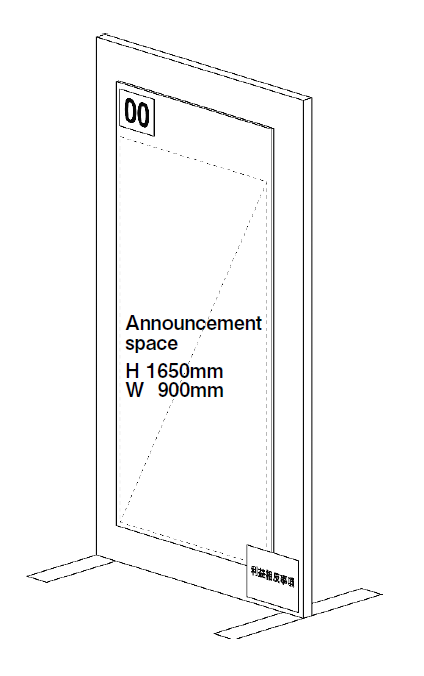 Please do not mount anything in the upper left corner of the panel (15 cm × 20 cm), as there will be a poster number in this space. Please bring your own abstract title and author information for the board. At the bottom of the panel posters, please disclose any conflicts of interest. Thumbtacks are available at each panel. *Authors are responsible for hanging their poster and removing all materials from the board during the interval noted above. Any material remaining thereafter will be discarded. Each meeting room will be equipped with a computer and an LCD projector for PowerPoint presentations. PowerPoint presentations must be handed in at least one hour prior to the lecture. At the Preview Center you can check and rehearse your PowerPoint presentation. All speakers are requested to present themselves at the Speaker’s Preview Center at least one hour before the session (or the day before for morning sessions). The PowerPoint presentation will be checked by congress staff and prepared for the lecture and stored on the central congress server. Your PowerPoint presentation will be made available in your lecture room via a computer network. There will be a room attendant to help you to operate the computer if necessary. From the lectern you will be able to use a control for your PowerPoint presentation. In case you would like to connect your personal laptop in the lecture room, please make sure you have supply cable for your PC. A pointer/laser-pointer will be available. Neither overhead projector nor slide projector will be available in the lecture rooms; double projection will not be provided. No changes in your presentation can be made in the lecture room. If you want to make any changes after you checked your data in at the Preview Center, please go back to the Preview Center for revisions. Store all your files in one folder. Please make sure that graphics, animations, videos and your presentation are all in the same folder. Avoid creating symbols as graphics or using special fonts that are external to your Microsoft PowerPoint or word processing program since these might be displayed incorrectly. Instead, always use the ‘Symbol’ function in the ‘Insert’ menu of your program to insert symbols. Colors: Use light-colored fonts for texts on dark backgrounds or vice versa. A strong contrast is important for good legibility. Legibility check: On presentation mode, your text should be large enough to be easily readable 5 feet (1.5 meters) away from your computer screen.